We had the pleasure to interview seven former exceptional college tennis players that turned professional and currently try their luck on one of the most challenging pro tours in the world. Each player has a unique and inspiring story to tell. So, let's get started and dive into the lives of Jackson Withrow (Texas A&M), Dennis Nevolo (Illinois), Sander Gille (East Tennessee State), Yannick Maden (Clemson), Yannick Hanfmann (USC), Aleksandr Nedovyesov (Oklahoma State), and Evan King (Michigan). Almost every tennis player dreams of cracking the Top 100 in the world, competing in one of the prestigious Grand Slam tournaments, and turning their passion into their profession. Unfortunately, for the vast majority of these players, this dream will never become a reality. Luckily for us, there is plenty of success stories to share as well. And we want to highlight seven players that, in our book, are success stories. Not only because of their current ranking and other accomplishments, but also because of their work ethic, determination, and dedication to the sport. One thing all seven players have in common is that they competed on the collegiate level first before turning pro. College tennis is doubtlessly one of the most beneficial "resources" an aspiring tennis player can take advantage of. It is the perfect intermediary between junior tennis and the professional tour. 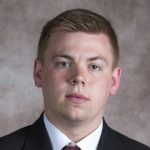 Players do not just get to practice in and experience a professional environment, they also learn valuable lessons related to time management, recovery phases, discipline, or leadership. However, don't just take our word for it. Let's hear from some experts that by now have experienced both worlds and shared some of their knowledge and insights with us. Enjoy! 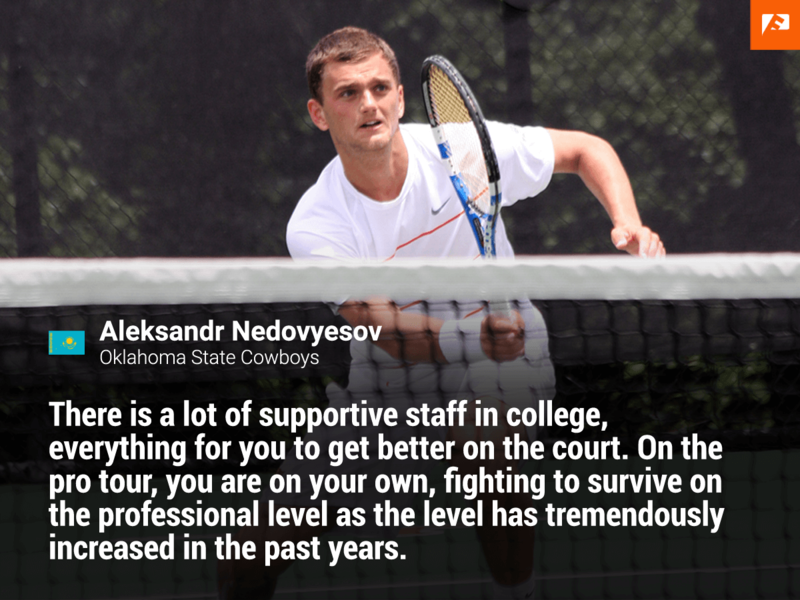 How has College Tennis prepared you for the Pro Tour? Definitely the maturity aspect, everyone matures at different stages and I thought the best decision possible was to go to college. It gave me valuable lessons that I’ll always cherish and helped me grow into the person I am today. You not only learn how to manage your life but how to overcome adversity when tested. College tennis is a great preparation for the pro tour. The reality is the pro tour has gotten extremely physical. As an 18-year-old, I was nowhere near ready to even play futures. Coming from Chicago and not having a lot of high-level players to hit with, being on a college team with 8-10 very good players forces you to become better. I really believe just being around more talent makes you better right away. Having a great coaching staff at the University of Illinois scheduling the right kind of practices and fitness programs was also very beneficial. After my first year, I got my first ATP point. After I graduated I was tough enough to get a solid base of points right of the gates and give myself a chance to compete and test the waters. It has been fun to see a few of the college guys go on and have great careers. Everyone has an athletic ceiling and tennis skill set. I do believe that college can be a great pathway to helping players maximize their abilities and prepare them for a tougher pro tour journey. During college I never had the intention of becoming a professional tennis player. Therefore I did not always have the right mindset to become a top player, nor did I have the right structure, guidance or support. Don't get me wrong, I had a lot of support and they did their job as well as they could, but college and the pro tour are two completely different worlds that require different approaches. I would say that the most valuable and useful aspect from college for an upcoming professional is the amount of matches played (many), as well as the huge diversity of high level opponents. You learn to adapt to and battle against different styles, while also building a strong physical base. It prepared me most physically for the tour. The time training and playing high-level college matches from 19-23 years old in a controlled team environment helped me to get more stable in my performances. It has taught me a lot of tough lessons on court that I had to fight through in my years. That gave me the mental strength that is sometimes necessary. In college, you play a lot of matches. A lot of the times I wasn’t healthy. Somehow you still can fight through it. That transitions well to the pros since you can remember the tough times and know you can fight through rough matches. I think the main thing that I have learned in college is time management. 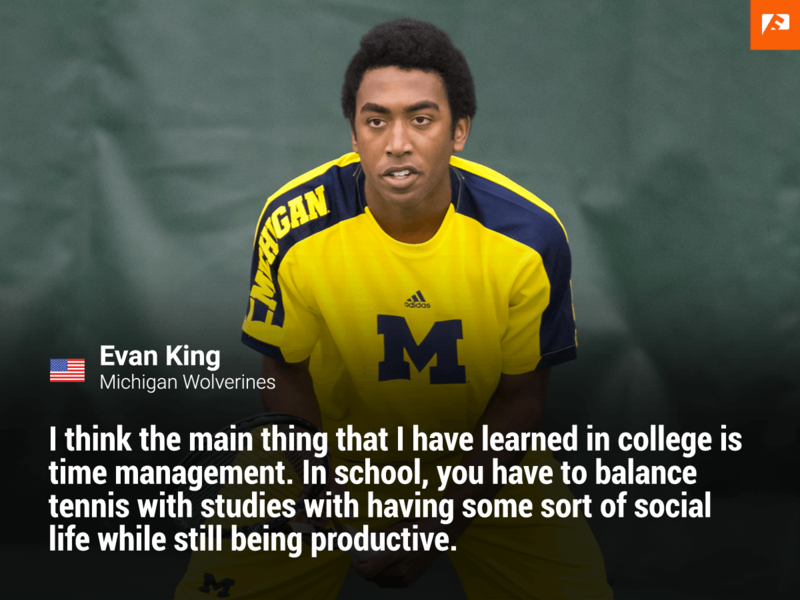 In school, you have to balance tennis with studies with having some sort of social life while still being productive. The same applies as a professional. In a way, college was easier because in many cases your schedule was made for you but as a professional, I have to make my practice schedule, fitness schedule, eat correctly while still having the time to have a life. College was a good trial run for all of the above. What was your most memorable college sports moment? Honestly, my most memorable moment in college tennis was coming back and playing tennis again for the first time after having 4 wrist surgeries. I loved every minute with the team and to have that extra year and a half was pretty special. I have two "most memorable" college tennis moments. My first one was clinching a 3-3 match against the University of Florida at home. The University of Illinois indoor season always gets pretty rowdy and I was up against one of the better players in the country. I won the first set and I was in a breaker in the second set. My opponent aced me like 4 times in a row to win the 2nd set and for whatever reason, I just got in a zone. I think the crowd got to him as well. Our team manager and great friend who recently passed had these bongo drums and horns and really got the crowd going. I owed him one for that. I rattled off 6 games in a row without missing a ball. An amazing feeling having your teammates come running at you. My second favorite moment was watching my teammates win the big ten title. I had no answer for The Ohio States Chase Buchanan. Our freshman pulled off some huge upsets and there we were watching my senior and good friend Roy Kalmanovich play against arguably the best player in college Blaz Rola. Roy had lost the previous week 6-0 6-0 indoors. But this week we were outside which to him was a very big deal. He clinched the 3-3 match in a tough 3 setter and we finally snagged one from the dominating Ohio State team. A team title is a better feeling than any individual one. Great tennis, great match! My most memorable college tennis moment was when I clinched the deciding point in our first round of the NCAA championships in my sophomore year. It was only the second time in our school's history to win a round in the NCAA's, and me giving my team that final point has always been very special to me. Losing in the NCAA's round of 32 against University of Tennessee in a heartbreaker. It also was the last match with my teammates. Winning two NCAA team titles was incredible. Winning the College Player of the Year award. My most memorable college tennis memory was pretty low key. My school (Michigan) was playing Illinois (the state where I am from) and I got to play Dennis Nevolo who is a very good buddy of mine. We had played a billion times before in practice and a few times in college, but what made this special wasnthat it was a 3-3 dual match and we had the entire third set to play. I remember thinking about how cool it was when we were about to start the third set. To-date, what is your most memorable pro tour moment? Winning my first ATP title in Delray Beach with one of my best friends. Comment: His doubles partner was Jack Sock who is currently #16 in singles and #26 in doubles in the world (as of 4/8/2018). Both are also playing together this week at the ATP tournament in Houston. My most memorable pro tennis moment was about two years ago when I won my first (and only) ITF Futures singles title. I actually stopped playing singles by now, due to a bad elbow injury, and focus solely on doubles which is going very well. Me and my partner have won many titles already, both on the ITF and ATP Challenger circuit, giving us plenty of beautiful memorable moments. But that singles title I will always remember, as my grandfather passed away just a month earlier. He was the one who spent all of his time on me, driving me around for practices, cheering me on every single match, etc. I had been grinding on the tour for two years at that time, making decent results but never a title. And then it finally came... I devoted that title to him! It was the first time ever I played an ATP tour qualifying event in Antwerp 2016. I qualified right away and played in the main draw against a former Top 10 player Gilles Simon. I had support throughout the tournament from my girlfriend and her family. It was a great achievement at the time and gave me lots of motivation to work harder. 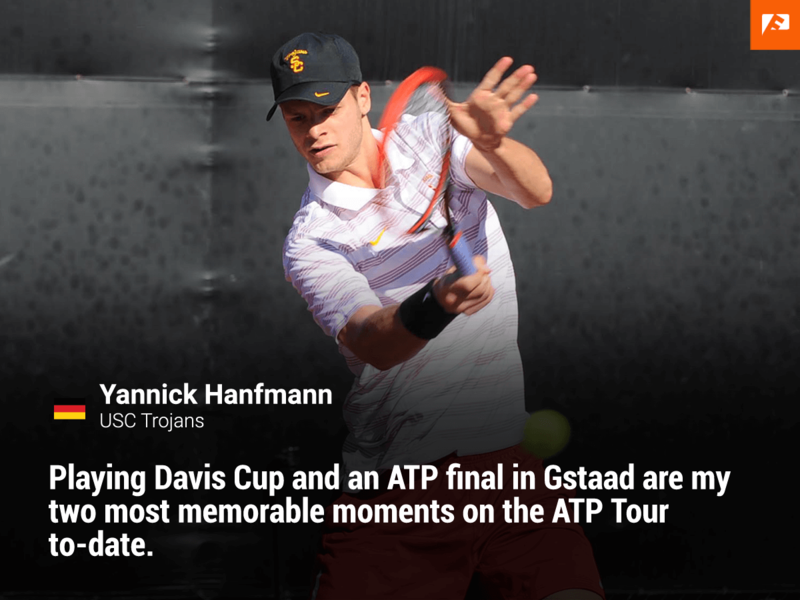 Playing Davis Cup and an ATP final in Gstaad are my two most memorable moments on the ATP Tour to-date. Comment: On his way to the final in Gstaad, an ATP 250 event, Yannick beat three top 100 players [Feliciano Lopez (#27 in the world), Robin Haase (#50 in the world), and Joao Sousa (#61 in the world)] before losing to Fabio Fognini (#31 in the world) in the final. Beating Fabio Fognini in the decisive rubber in Davis Cup tie as well as beating Federer-Wawrinka in doubles. My favorite pro memory was qualifying for the US Open. As an American tennis player, I dreamed of playing in New York and having that dream come true was surreal. Absolutely crazy feeling when I won the last point to qualify. What is the biggest difference between college tennis and the pro tour? The loneliness. In college tennis you have your team, coaches, and support staff. In pro tennis, it’s just you out there on an island. Some guys may travel with coaches or physios, etc. but handling the traveling each week and understanding that every week isn’t going to be as successful as you hope. Finally managing losses is what I found the most challenging because unless you’re winning a tournament every week you’re going to lose week in and week out. 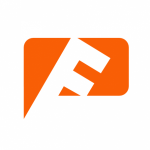 The biggest difference is the level of competition you have to face consistently and the ranking format. 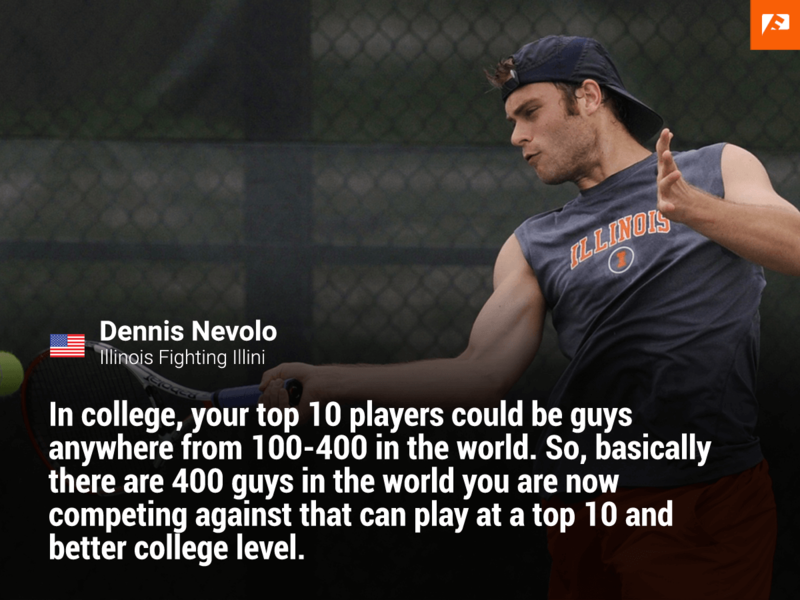 The reality is you can win a couple of college matches and be a 10 top stud. The pro tour is far from that. You have to grind through the futures circuit, racking up points, and going deep in really difficult events. Or go through challeneger qualies where you aren’t guaranteed points or money. You have to basically play the NCAA tournament every week if you're looking at tough futures and challengers. Take former national champion Blaz Rola. Amazing player that reached the top 100 his first year out. There are a lot of challengers where he loses 1st and 2nd round and those aren't the highest level events. There is just a lot of players. The best players that you played in college are the guys you have to see every week. What seperates you? What can you do consistently enough to break through? Can your body handle the schedule and the travel. Guys that I played like Shapavalov, Sandgren, Zverev, Goffin and Steve Johnson all had the skill sets and physicality to build momentum and win big tournaments. They also feel comfortable competing against the best. In college, your top 10 players could be guys anywhere from 100- 400 in the world. So basically there are 400 guys in the world you are now competing against that can play at a top 10 and better college level. In my opinion unless you are serving 125mph and winning challengers, go to college. The Futures circuit is no way to spend your years from 18-25 depending on how good you are or how long it would take you to break through. Be on a team, be with your friends, improve, and give it a shot when you are more physically and emotionally ready. If you aren’t ready by that point then you wouldn’t have made it anyways. For me, the pro tour is a lot tougher to cope with than college tennis. Many players, including myself, have to fund our own careers, which gives an incredible pressure stepping onto the court. You literally cannot afford to lose. Especially in the early stages, you lose so much money that it gets very tough to deal with, and you easily start doubting yourself and your chosen career path. A second big thing is the pressure of grabbing ATP points in order to move up the rankings. You solely rely on yourself, and when you lose, you are done. Back to zero, and hoping/praying that next week will go better. In college your teammates can make up for your "mistakes".Your personal loss does not always mean a bad outcome for the team. The traveling is much more playing a full year on the tour. There is less stability and a lot more matches. On the tour, you’re mostly on your own. You also travel a lot. And you have to take care of yourself. In college, you're technically being taken care of all the time. That’s the biggest difference. There is a lot of supportive staff in college, everything for you to get better on the court. On the pro tour, you are on your own, fighting to survive on the professional level as the level has tremendously increased in the past years. I would stay the biggest difference between college tennis and the pro tour is not traveling around with your team. In college, everything is handled for you. Rackets, hotels, flights, stringing, etc... As a professional, you have to be on top of every part of your life. You are basically running your own business. 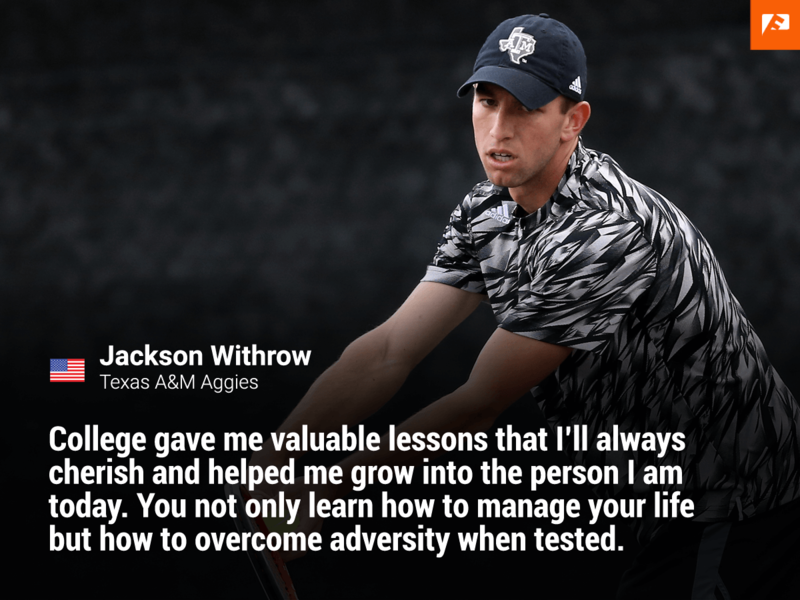 If you could give one piece of advice to college tennis freshmen, what would it be? Worry on progression and not results. Results will come if you buy into good things happening and believing that you are doing the best you can everyday to get the most out of yourself. My advice would be to manage your time wisely. You get to college and there’s just a lot going on. You got your classes, early morning practices, fitness and social life. You have to be able to balance these things and get good sleep. Also just be a good teammate. Don't get caught up with where you are playing in the lineup. It really doesn't matter. Just compete for your team and try to improve and have as much fun as possible. It’s the only time you will play on a team in your career and nothing feels better than having your team win. 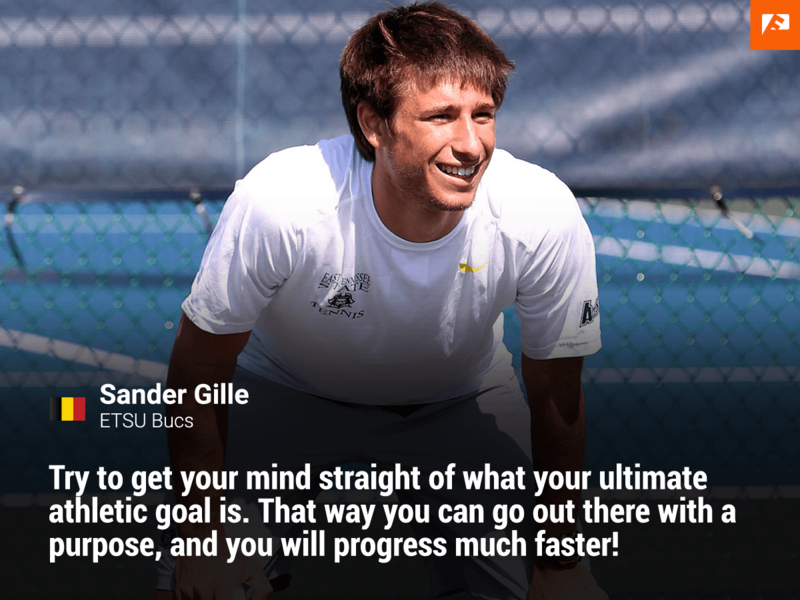 Try to get your mind straight of what your ultimate athletic goal is. That way you can go out there with a purpose, and you will progress much faster! However, do not forget to enjoy your time as a student. It's one of the most wonderful times of your life, so don't get too hung up on your athletic goals all the time. There is more to it. 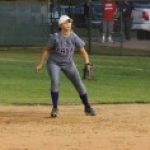 Comment: Lauren Sieckmann, a former college volleyball player who is now an actress & model with over 75,000+ social media followers, also talked about 'Balance'; a concept she considers to be critical for success in your college sports career. Try to make the best of every practice and have the goal to improve daily as the highest priority while still enjoying the team spirit and the time in college. Embrace the time as a college player. Don’t see it as "pressure to perform" but really try and get another perspective on it. You’re lucky to be in a position where so many other tennis players would love to be in. And another thing would be to really embrace school as well. Don’t get too stuck in the tennis world. College has so much more to offer that you can only experience in those years. Take advantage of that. Try to get better every day, don't waste your time. My advice would be to take everything in that college has to offer. Don't take anything too seriously and enjoy your college years. They will be some of your best. If you could go back in time and change one thing in your athletic career, what would it be? Not worrying so much about results at the beginning of my career. I was so focused on stats and wins/losses rather than looking at how I was progressing as an athlete. Until I realized that I felt like I wasn’t able to reach my potential. I don't really have any regrets. Maybe after college, I should have gotten more of a base to train out of. I was traveling so much and wasn't really looking to invest any more money anywhere else. It’s a tough balance. I think the USTA is doing a much better job of trying to create a culture for all players attempting to play pro by providing housing and training for free or at a major discount. I believe they are taking a step in the right direction trying to bring more players together. That was probably something I needed my first couple of years. I don't regret any of my decisions, but right now I feel it would have been useful if I could have surrounded myself with a professional entourage at a younger age. Tennis is a sport that requires many, many years to reach the top regardless of your talent/potential, so details make an enormous difference. I am 27 years old right now, and I have had just a few different coaches, who all gave their absolute best, but none of them has or had any experience with the level that I am competing at right now. Therefore I am learning on the way, living it, which is an incredible experience, but it costs much extra time to reach your full potential. I waited for a year and a half after high school graduation to go to the US (due to injuries and also wanted to become pro right away). I would go immediately after high school graduation to college to also avoid having to sit out a year. Plus, I wasn’t good enough to be a professional back then. I truly do not have any regrets. If you have made it this far, thank you very much for your attention. This means the absolute world to us. We hope that you enjoyed this story and if you did, please share it with someone that could also enjoy this story.